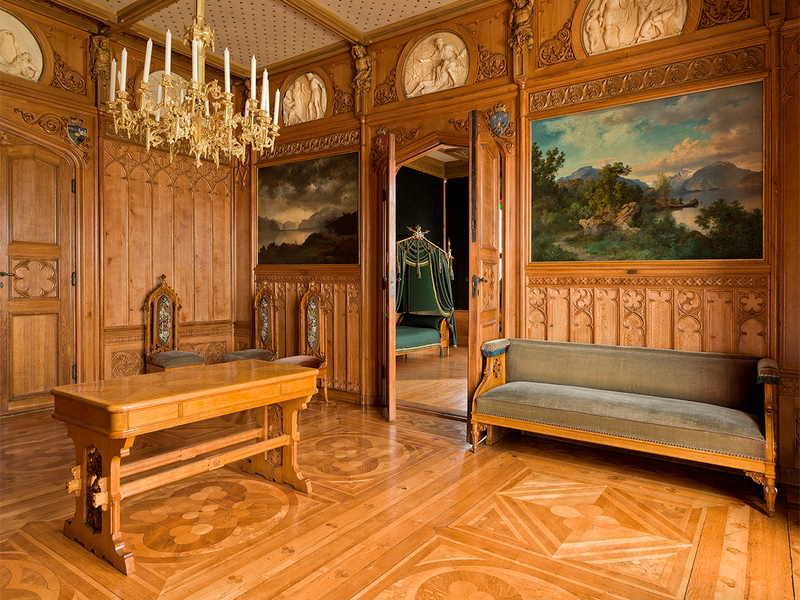 Oscarshall summer palace is open to the public during the summer season. The 2019 season starts 1 June. 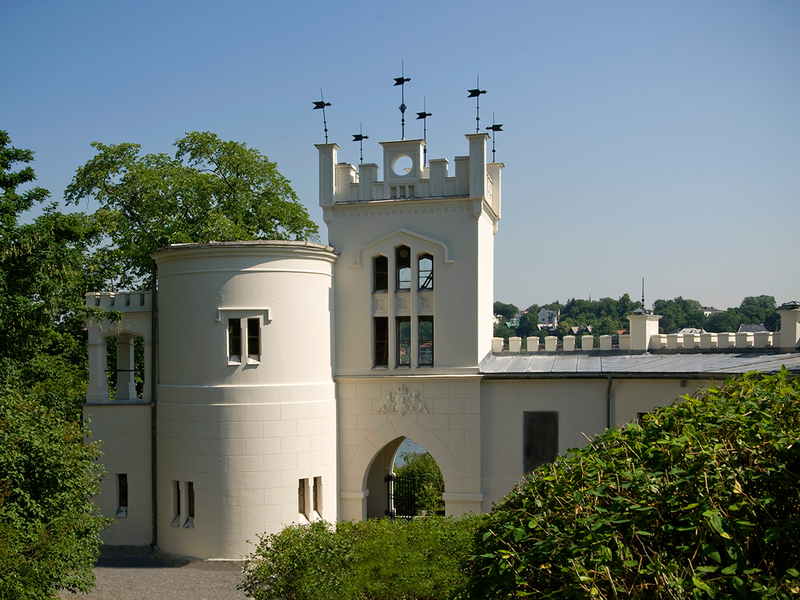 The summer palace of Oscarshall is located on the peninsula of Bygdøy just outside Oslo city centre, surrounded by a romantic park. 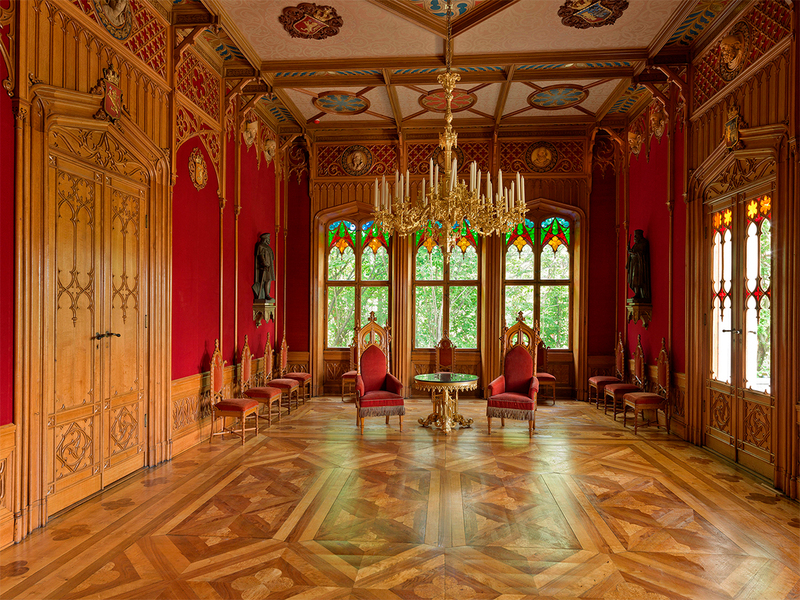 The park and café "Dronning Joséphine" are available to all during the opening hours of Oscarshall. There is no need to by a ticket to enjoy the park or visit the café. Unfortunately we are unable to offer regular guided tours in English. However, we do our best to adapt the tours to the English speaking audience. We also offer booklets with information in English. Guided tours in English for closed groups are admitted in the season by appointment. The tour of Oscarshall is a guided tour of the main rooms on all three floors. On the ground floor, we find the vestibule with its almost sacral atmosphere. 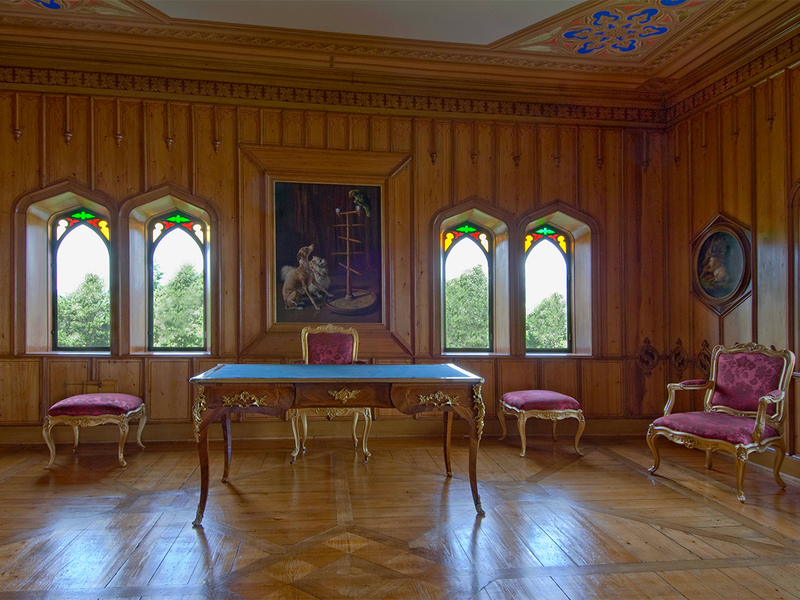 In the Salon, both the furniture and the ornamentation emphasise the medieval atmosphere, and evoke the style of the old Norwegian guildhall. 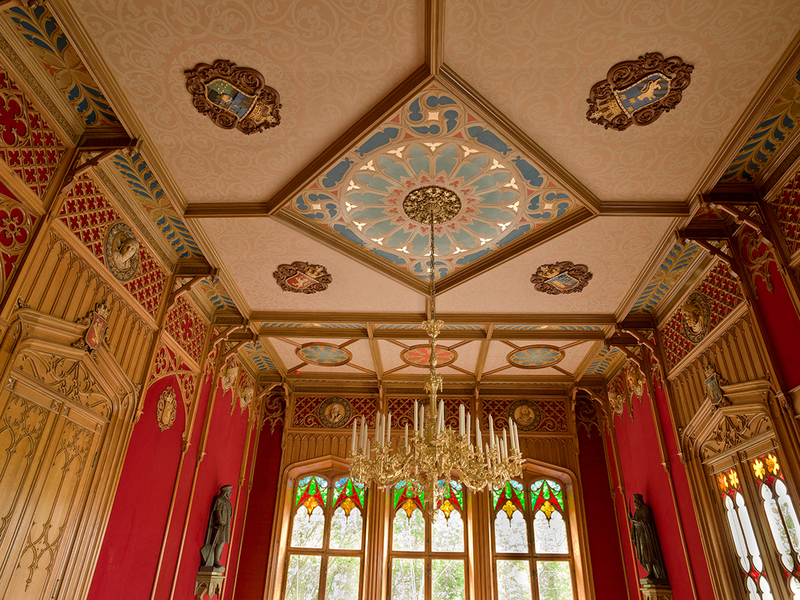 The Dining hall is deocorated by the Norwegian painters Joachim Frich and Adolph Tidemand. 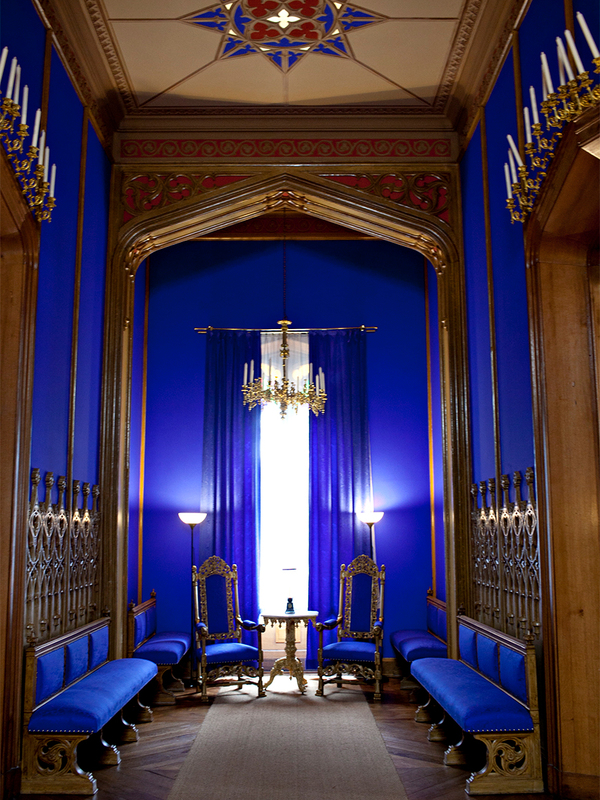 The salon evokes the style of the old Norwegian guildhall. Photo: Anette Karlsen, NTB scanpix. On the 1st floor lies the King's appartment, and on the 2nd floor - that of the Queen. 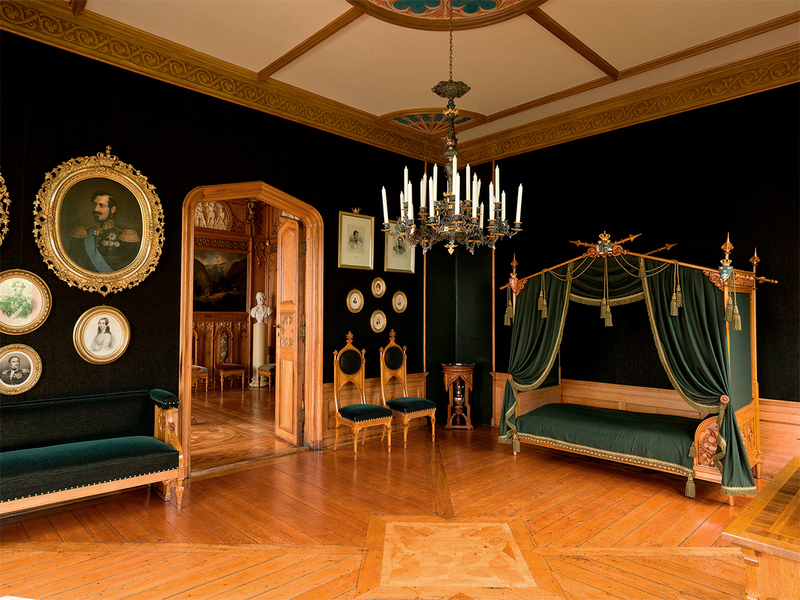 The Queen's apartment har recently been refurnished - brought back to how it might have looked when Queen Joséphine herself stayed there. Please find more information about the rooms via the link list. We encourage visitors to take a walk in the palace park after the tour. Tickets are available in the museum shop to the right of the main building. Please find detailed information on ticket prices and opening hours in the "Facts" sections to the right (or at the bottom if you are using a mobile device). Tickets are available at the lodge to the right when arriving at Oscarshall. Photo: Anette Karlsen, NTB scanpix. Due to closed events, Oscarshall may be closed to the public. These dates will be announced here and on Facebook. The 2019 season at Oscarshall begins 1 June and lasts until 8 September. In the season, tours start every hour and last approximately one hour. The last tour starts at 16:00. Please note that all tours are in Norwegian. Wednesday - Sunday 11:00 - 17:00.